The Samsung Galaxy series certainly should be compatible with Linux. After all, they run the Android operating system, which is based on Linux. The About phone screen even shows the base Linux kernel version. This page shows how I've connected my SGH-T989, the T-Mobile version, running CyanogenMod, based on Android and the Linux kernel. However, if you download the manual (11.0 MB), you see nothing about using it with computers running Linux, BSD, OS X, or any other Unix-based operating system. 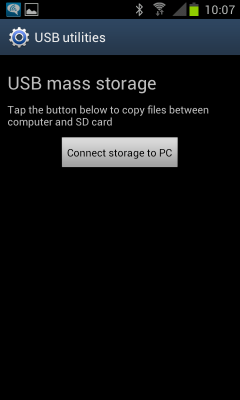 Be aware that Android and therefore CyanogenMod dropped support for USB mass storage starting with Android v3.0. It used to be as easy to use as a USB thumb drive, now it takes a little work to set things up to work with the PTP/MTP protocols. The alternative is to unmount the MicroSD card, remove it from the phone and place it in a reader. You will need the mtpfs program, which will probably be in a package with the same name. See my page on software package management for details on how to figure out which package you need to add and how to go about that. You may want to look at the mtpfs web page for further details. You see me making that change below. [271527.437807] cdc_acm 2-8:1.1: This device cannot do calls on its own. It is not a modem. Device 0 (VID=04e8 and PID=6860) is a Samsung Galaxy models (MTP). Meanwhile you have access to the file systems on the phone, the internal storage and that on the SD card. Timestamps are also strange on the FUSE file system, everything's time stamp is -1, or one second before the UNIX epoch began in 1970. Another thing to consider: enable SSH service on your phone and connect to your phone over SSH over 802.11 wireless. Download and build gmtp using gmake. Run gmtp and click the Connect button. Again, expect this to take 40 seconds or so. You will get a pop-up window asking if you want to connect to the SD card or internal storage. Select one, click OK, and browse away. d---rwxr-x  2 system  sdcard_r    32768 Mar 11 20:00 .
d---rwxr-x  4 system  sdcard_r    32768 Mar 11 15:51 . The mode is persistent, chmod 644 * runs with no error and a return value of 0, but it has no effect. So, the dmask and fmask options are why directories and files get these strange permission masks. My real question is why those strange permissions are needed. 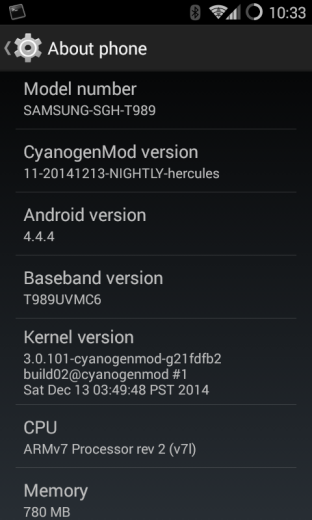 Update: a later version of Cyanogenmod fixed this. Content below this point is now of historical interest only. 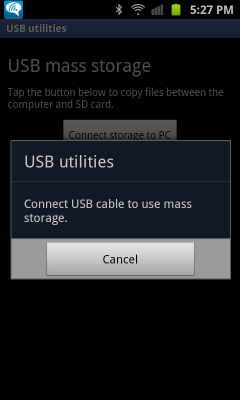 Android and therefore CyanogenMod dropped support for USB mass storage starting with Android v3.0. 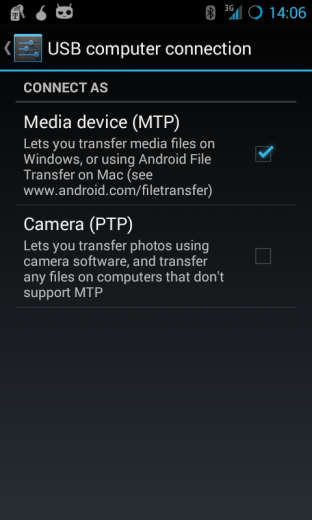 Use the PTP/MTP protocols as described above, or simply unmount the MicroSD card and place it in a reader. Here is how to use the Samsung Galaxy S2 with Linux or OpenBSD. The steps are exactly the same, except for the device name used in one mount command. How did I get these screenshots? I explain how to do that here. Start by tapping the Home button at the bottom of the display, to go to the home screen. That's what you see at left below. 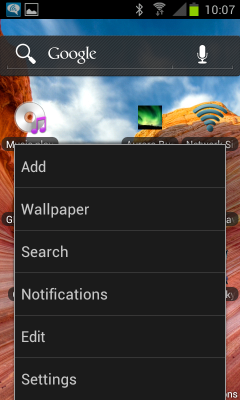 Tap the Menu button at the left side at the bottom of the display. That's on the frame outside the display, it doesn't appear in these screenshots! This will bring up the main menu. At right you see how that has come up from the bottom of the home screen. The Settings menu will appear, as seen at right. 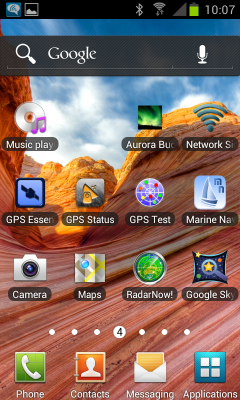 Notice that is it taller than what fits on the screen, you can swipe the screen upward to expose the lower choices. However, you want to tap the More... button near the top. 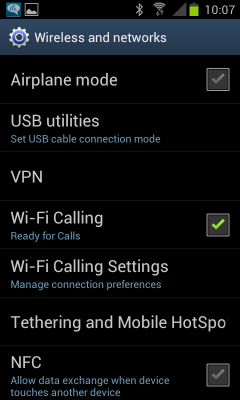 Within the Wireless and networks menu, tap USB utilities. The display at right will appear. Tap the button Connect storage to PC. A screen similar to the one seen at right will appear. This is actually a screenshot from the earlier Android 2. * or Gingerbread. 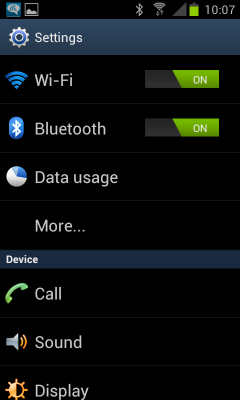 One change in Android 4. * or Ice Cream Sandwich is that you cannot capture a screenshot at this point. This may seem a little mysterious as there appears to be nothing to do but cancel. What this means is that it is time to connect the USB cable. When you do, the display will change very slightly, as the screen seen here dims. You no longer see the little Android mascot at this stage. The operating system on the computer detects the device, and the dmesg command will display the end of the kernel ring buffer. Some enormously long file names have been truncated in the below output. Samsung's Kies software does not understand subdirectories of the media directory. You can create them when the phone is mounted as a Linux storage device and put MP3 files into them, and the phone will find the files without any trouble. However, it does not organize the music by those subdirectories. If you have used the Artist and Album MP3 ID3 tags, Samsung's Music application will present those groupings to you. Also see my page about using digital cameras with Linux and BSD.